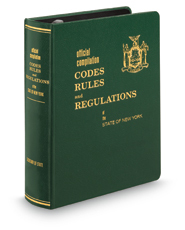 Financial Services Title 23A contains the complete, official text of Volume 23A of the New York Codes, Rules and Regulations, covering regulations promulgated under the Financial Services Law. Enhancements include historical notes and effective dates, as well as updated case notes explaining how courts and administrative agencies have ruled on gray areas of the law. Caselaw citations are tested to include later history, plus official and parallel citations. New York and federal cases from the past 10 years were reviewed to ensure that all relevant decisions were included.